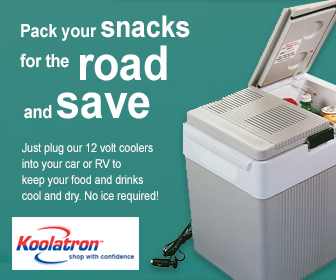 Great value in a lightweight travel trailer! We had the pleasure of visiting John Petrie at Niagara Trailers in St. David’s Ontario, located just a few minutes from St. Catharines, not far from the QEW highway, where we had the opportunity to check out the 2018 KZ Connect 241 RLK (Rear Lounge Kitchen) model from the Shipshewana, Indiana company. 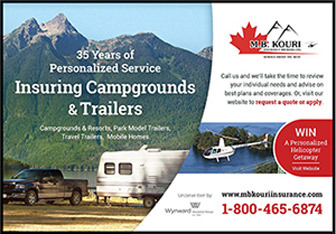 K-Z has been building lightweight and affordable travel trailers since 1972, with an excellent reputation for quality construction and value at a price that meets the needs of the average RV family. 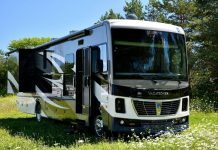 K-Z builds several RV lines – Durango, Connect, Escape, Sportsmen, Classic, Sportster, Spree, Sidewinder, and Venom, along with its Venture line of towables. We selected the KZ Connect 241 RLK travel trailer for this RV Show issue of RV Lifestyle Magazine as it is an excellent example of a mid-range lightweight trailer, with all of the features most families need, plus a few extra perks… all in a very well-designed package. 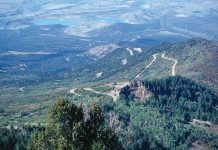 K-Z has an excellent reputation for building quality RVs at affordable prices. 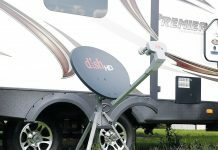 The Connect 241 RLK is a fine example of decades of RV experience blended with modern materials and manufacturing techniques. We were very impressed with the overall fit and finish in this vehicle, and with the level of quality control… this is becoming a concern within the RV industry, as manufacturers race to meet the highest demand in history for travel trailers, motorhomes, and fifth wheels – but with the K-Z models we checked out, the traditional focus on quality seems to remain a top priority – and that will add significantly to your enjoyment of the vehicle, and the resale value when it is time to trade up to a new model. This trailer invites you inside, with a large entry door, lightweight Euro-style steps built with a strong steel linkage and aluminum steps that feature anti-slip grooves, and a convenient handrail. 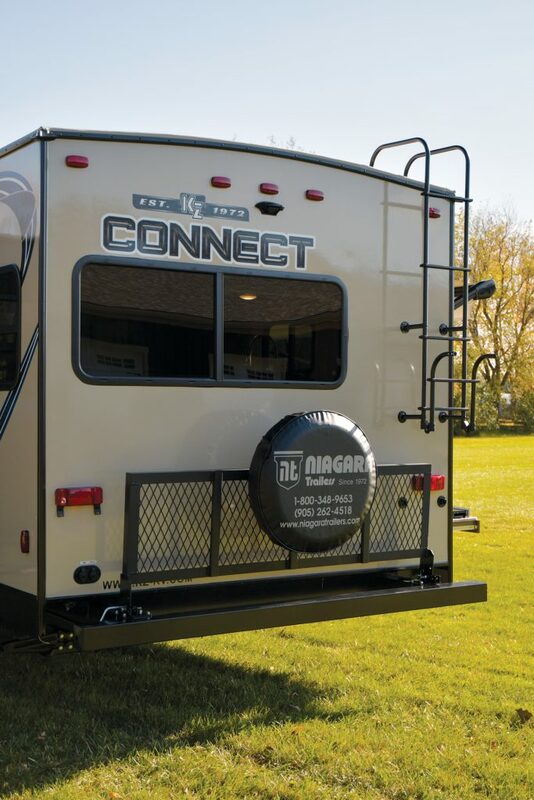 The Connect trailer has a rear cargo rack - part of a mandatory option package. 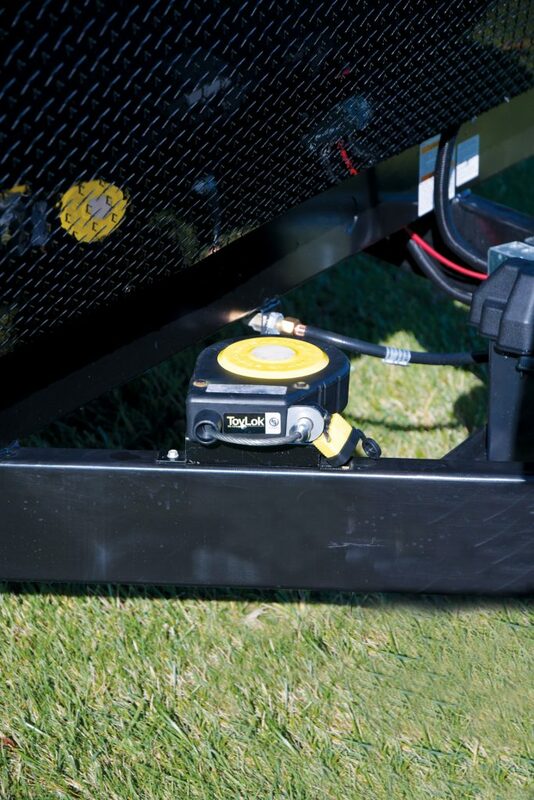 The Connect 241 RLK, like all of the models in the K-Z Connect series, is built on a heavy-duty I-beam frame, with 2” x 3” floor joists spaced every 16”, and fully welded outriggers. Above the frame, the sub-floor is constructed with 3” stringers and covered with 5/8” tongue and groove plywood decking, and this is covered with high-quality Armstrong® ToughGuard® Linoleum throughout the unit. This assures a creak-free, solid floor, that is easy to maintain. The bottom of the trailer is protected from the elements by a Darco® corrugated moisture barrier, and this enables the engineers to provide a heated, enclosed, and insulated underbelly, in which your tanks and storage compartments are arranged. Above your head, K-Z builds a roof that is engineered to last, framed with 4 ½” arched truss rafters and covered with 3/8” walkable roof decking, then covered with a layer of SuperFlex® Seamless 1-Piece roofing material. 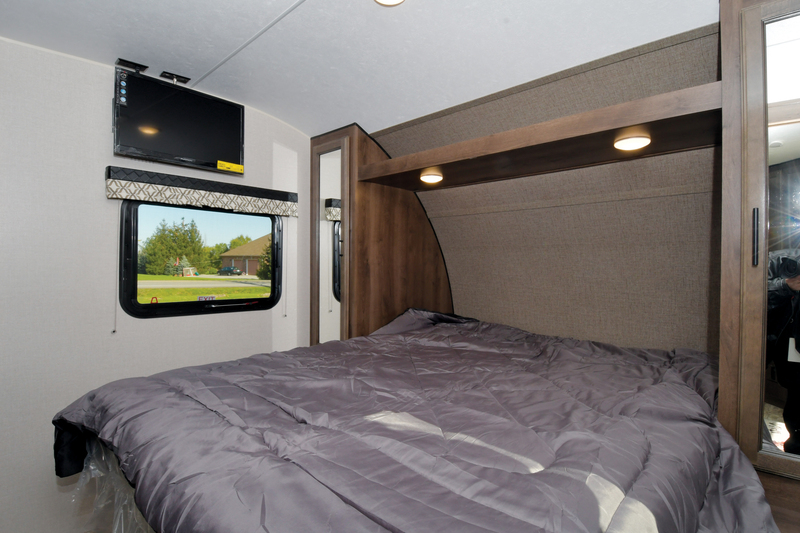 R-7 batten insulation keeps the climate inside the RV comfortable in cold or warm conditions. Our test unit included a 13,500 BTU roof A/C and a digital TV antenna with signal booster. The walls of the trailer are built with a very durable sandwich construction, with Lamilux® exterior fibreglass Gelcoat that is UVA and UVB resistant on the exterior, covering a wall frame insulated with expanded R-7 insulation. The interior layer of the wall sandwich is 1/8” luan wallboard. The exterior walls have a high gloss colour infused fibreglass surface – the colour scheme is “Sandlewood”. There is a protective front panel of Diamond Plate to reduce the effect of road chips. 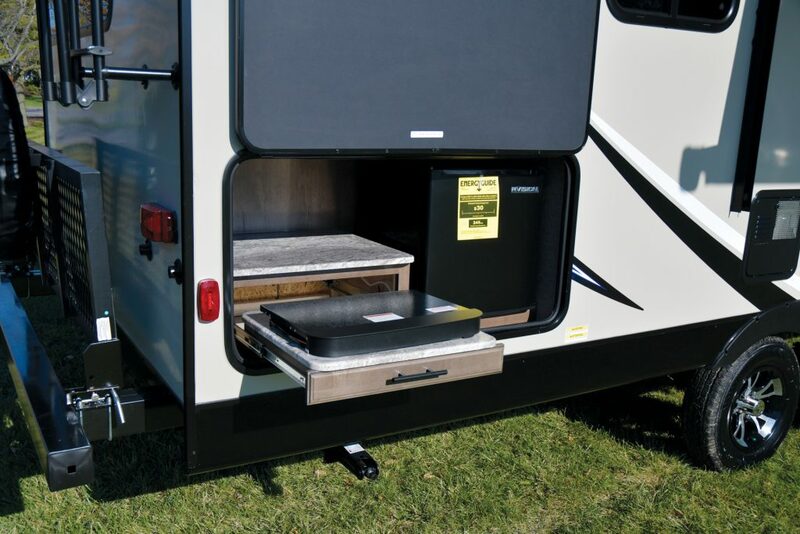 The 241 RLK features a dinette slide-out – this component is the latest in RV technology, using a rack and pinion electric slide mechanism with manual override and a box tube slideout ram. The 241 RLK has a large dinette. Our test unit featured the very tasteful “Stone” interior décor. 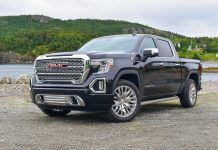 We towed the Connect 241 RLK with a 2017 GMC Sierra 1500 pickup. 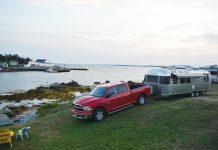 This tow vehicle handles a trailer of this size and weight with ease – indeed, with a an unloaded vehicle weight of 5,310 pounds, the Connect 241 RLK could be towed by any of a wide range of pickups or mid-size SUV models. The Connect series is engineered to travel. With Trailer King ST 205/75/R14 Radial tires on optional aluminum rims, Dexter E-Z Lube® axles, LCI Trail-Air Equa-Flex™ premium suspension that reduces fore-to-aft movement. 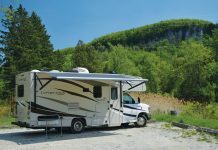 The trailer has heavy-duty leaf springs, and auto-adjusting brakes – in short, the Connect 241 RLK is equipped with the optimum trailer, suspension and running gear for an RV in this category. 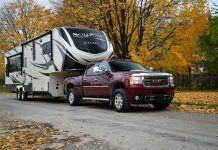 A trailer of this size and weight is best towed with a class III equalizing hitch, and sway control is always a good idea, whether you are towing with a pickup or an SUV. The exterior kitchen has a range and a small refrigerator. 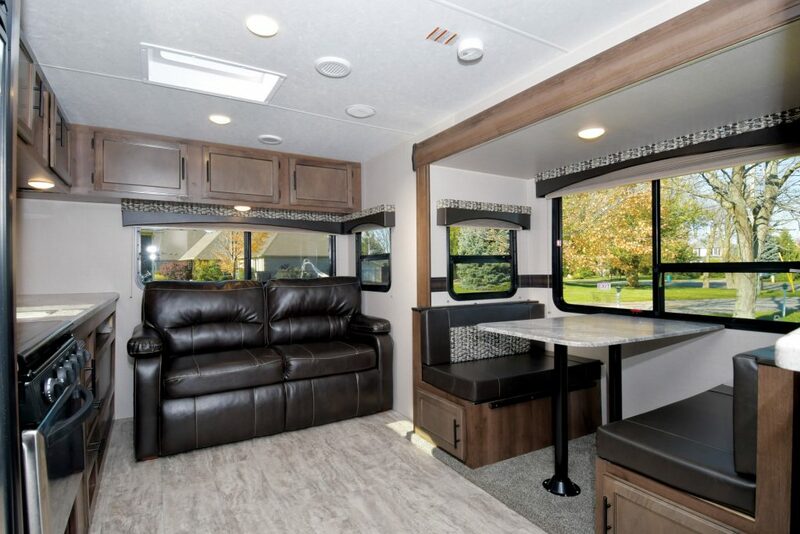 The Connect 241 RLK offers a full range of exterior features to extend your comfort to the patio area of your campsite. The Smart Arm Awning rolls out at the touch of a switch, and retracts in just a few seconds when it’s time to hit the road. There is an optional wind and motion security sensor for the Smart Arm Awning. Exterior stereo speakers with LED lights add a touch of class and ambiance to your evening entertaining. 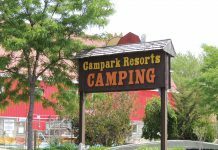 There is, of course, an exterior shower, and you have all of the RV and entertainment hookups within easy reach, placed just where you need them, including electric, water, and sewer connections, as well as cable TV and satellite hookups. 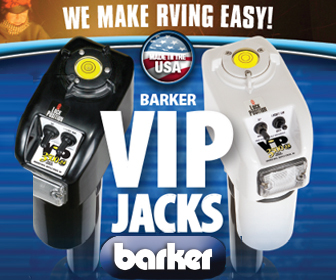 There are several unique features that caught our attention – for example, the Connect unit we tested was equipped with a ToyLok® – included in the K-Z Advantage Package – this is the ideal way to lock up your bikes so you don’t have to worry about them riding off into the sunset without you. Exterior storage compartments are spacious and easily accessible, thanks to large radius-cornered doors with magnetic catches. The Toy Lock is an option you will find very useful. 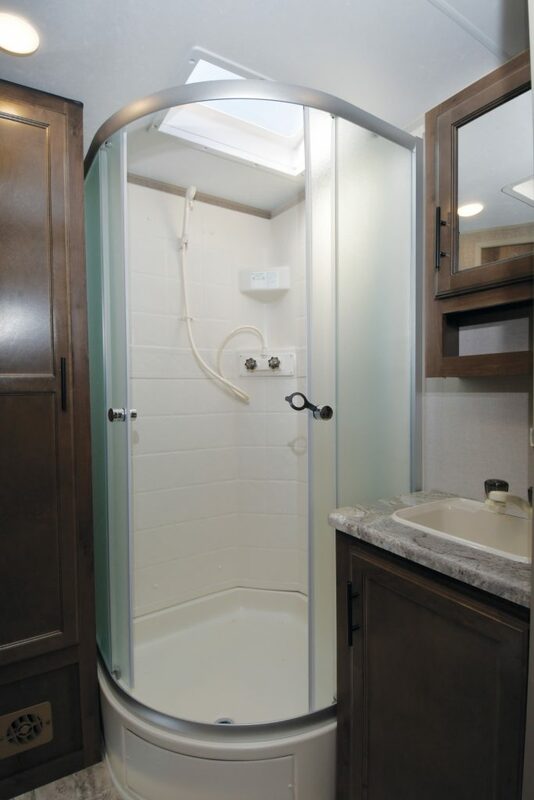 The trailer has an excellent interior floorplan, well suited for a family of four to six people. We always prefer layouts with large windows to let in the natural light, and overhead skylights and lumidomes, and the 241 RLK delivers on all of these points. Lots of counterspace in this fully - equipped galley! The galley features seamless countertops, an under-mount kitchen sink with cover and a residential quality faucet with pull-out spray-head. 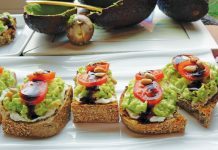 These are easy to clean, and well-sized for cooking. 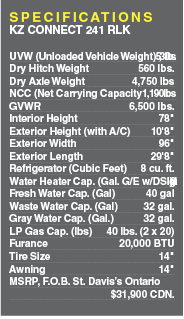 Appliances include an 8 Cu. Ft. gas/electric refrigerator with stainless steel doors, a stainless steel microwave/oven combo, and a 3-burner range with oven. 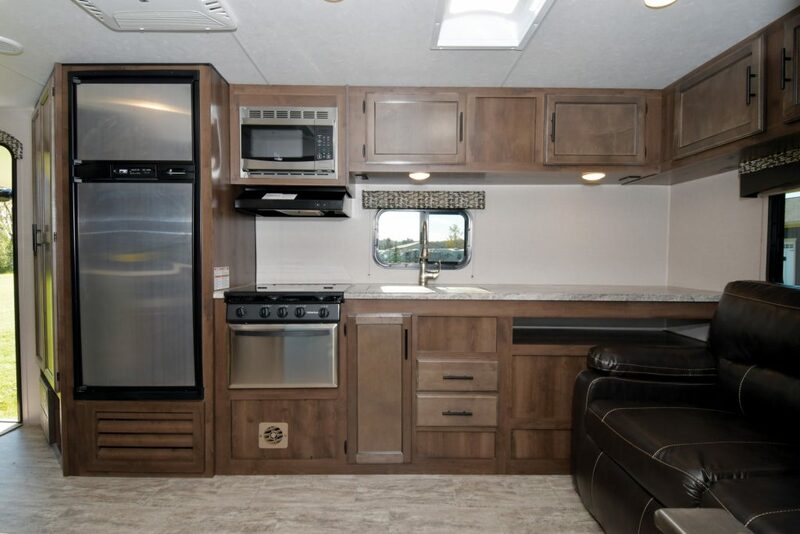 Cabinets and drawers are well built using Woodbridge maple cabinetry with hand-crafted mortise and tenon glazed cabinet doors, and all drawers and cupboards are large enough for your camping gourmet requirements. 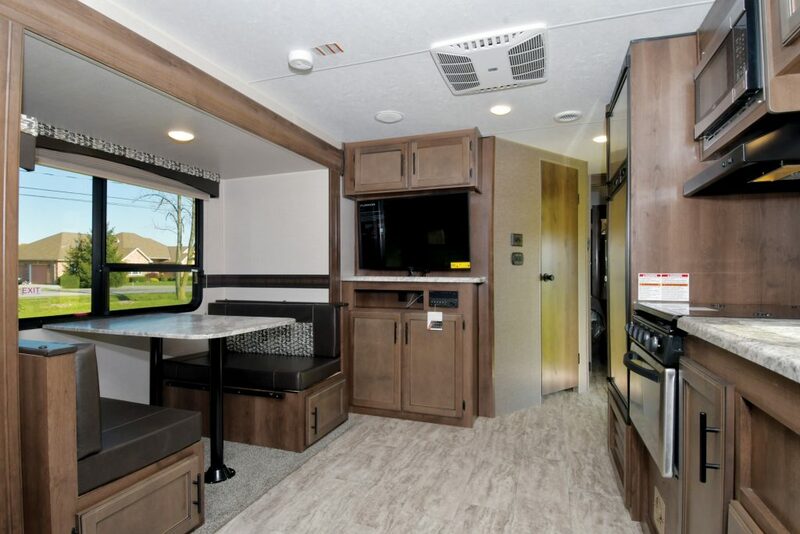 The exterior galley is equipped with a small RVision refrigerator and a two-burner cooktop mounted on a pull-out shelf under the countertop. The hatch that covers the exterior galley opens to store flat against the side of the trailer, held in place by a magnetic latch. Our test trailer featured the optional theatre seating, This seating arrangement also offers 12-volt dual USB charging ports. The queen-size bed is mounted on a plywood base with gas-lift struts to give you easy access to the under-bed storage. The Connect master bedroom takes up the front portion of the floor plan, and the queen bed with pillowtop mattress is conveniently placed so you can walk around it. Under-bed storage is easily accessible, with plastic bins to help you organize your gear. The closet space is well suited to a trailer of this size. 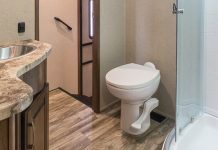 For a trailer of this size, the 241 RLK provides a spacious bathroom complete with a full-size shower, foot-flush toilet, and a vanity. The bathroom has a bright and roomy shower stall. 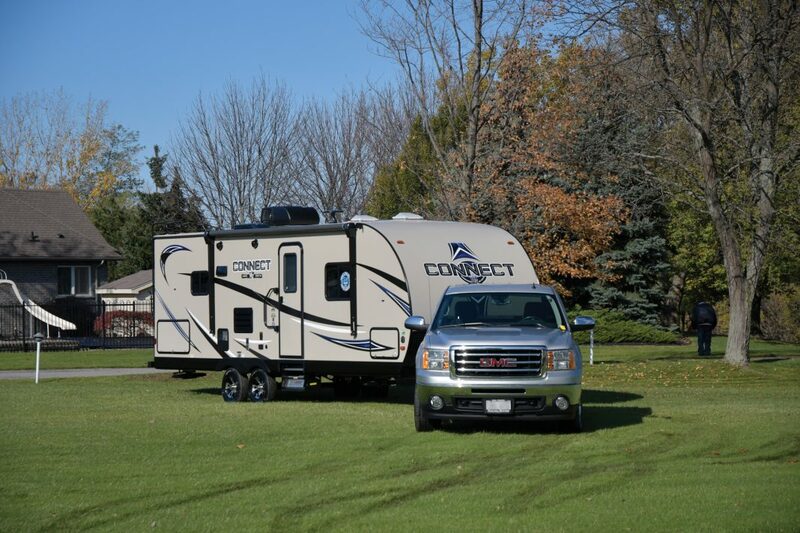 All in all, the Connect line is a very attractive and well-appointed choice for the active RV family. We were very impressed with the overall quality, and with the thoughtful addition of items that are not normally included with a trailer of this size and price point – from the fibreglass front cap, one of the features included in the Platinum option package, to the rear ladder and cargo storage system, this is a trailer that sets the benchmark for the category. 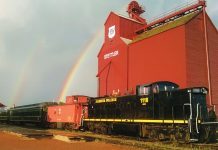 The Connect 241 RLK is covered by a 24-month hitch to bumper manufacturer’s limited warranty. 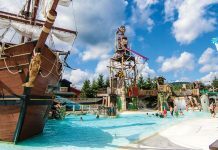 Previous articleTen Top RVs for 2018!